Once upon a time, there was a little girl. When she was about six, she walked to the video rental store down the street and came home with a VHS of a movie called The Empire Strikes Back. "I got Star Wars," she said to her mom and dad. "Oh, Empire?" they said. "You go ahead and watch it honey, but we don't feel like it right now." So she did. And she fell in love. By bedtime, she wanted to be Han Solo -- only, a girl. She was a nerdy kid, consuming books and movies as fast as she could get her hands on them. Star Wars was an early love, but neither the first nor the last. She had always wanted to be Robin Hood (ooh de lally!) -- only, a girl. A few years later, still a kid, she wanted to be Taran of Caer Dallben -- only, a girl. She wanted to be Captain Jean-Luc Picard -- only, a girl. She wanted to be Indiana Jones -- only, a girl. She wanted to be Aragorn -- only, a girl. She even kind of wanted to be Captain Jack Sparrow -- only, a girl. Still, the world moved on apace and "genre" fiction, will it or not, had to come along with. Dragged kicking and screaming, sometimes, but still. She grew up. By her late twenties, finally, she got to be Commander Shepard -- who, as far as she was concerned, was only ever a girl. And in her thirties, she had a baby: a daughter. And two years after that, someone made a new Star Wars movie, and she went to see it. And the hero was a woman named Rey: not "only" a girl. A badass. A main character. A self-saving woman with a staff and a brain and the power and will to use both. And the woman's heart was glad, for the little girl she had been, and doubly so for the one she was raising. Who, if she could help it, would never be "only a girl." Come in! Have a seat, and let's talk about music. 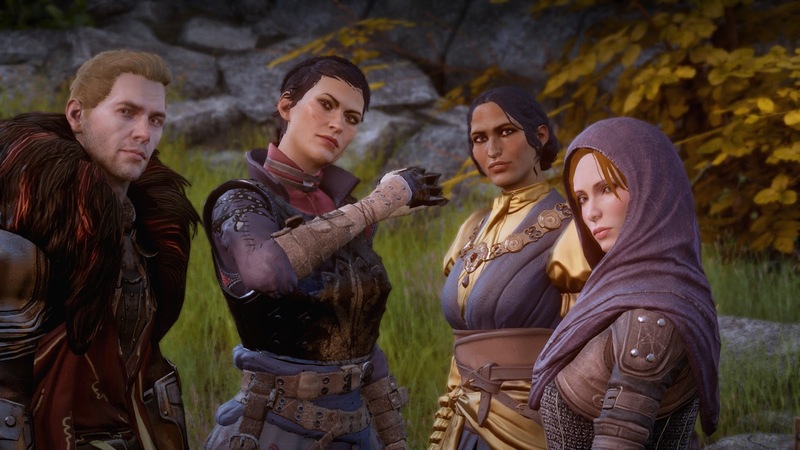 Specifically, the music of Dragon Age: Inquisition, which is beautiful and fun and lovely and very helpful, and which is also heavily recycled and manages to undermine the game it is meant to support in tons of small and large ways. This conversation has BIG FAT SPOILERS for basically everything that ever happens in the Dragon Age series, across all games to date.